I can hardly believe it’s been more than two months since I wrote my last post. The last quarter of 2014 was very busy as far as being creative was concerned. I was fortunate to attend some inspiring workshops and talks and took part in a couple of new challenges, everything was going great. Mid November the bubble burst when my Mum suffered a stroke. Priorities changed, naturally, but after a couple of months I am happy to report that Mum is getting back to her old self and I am back in my workroom. In fact I may be in here for a few days solid as I appear to have broken my toe after accidentally kicking the door frame yesterday! Is there ever going to be a better excuse for sitting and sewing? Anyway, this is the ideal opportunity to catch up on my on-line journal so here are a few photos of my recent attempt to paint, stamp and embroider onto fabric. I bought the Angie Hughes DVD sometime last Summer and loved the effects she created by painting, stamping and embroidering onto velvet. 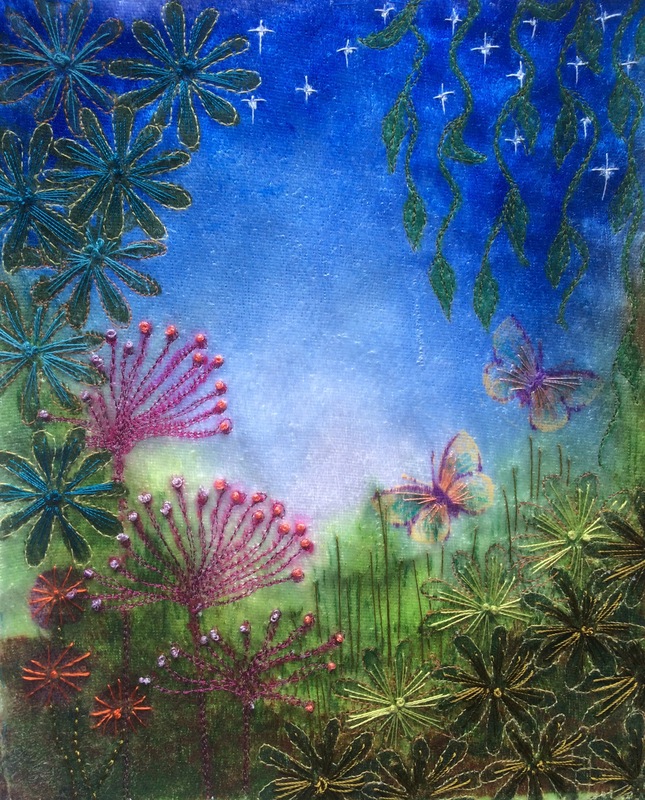 Angie works on 100% cotton velvet and uses bleach to discharge some of the colour – the results are fabulous! I decided to experiment with some white polyester velvet which I had in my stash before considering buying the more expensive cotton variety. 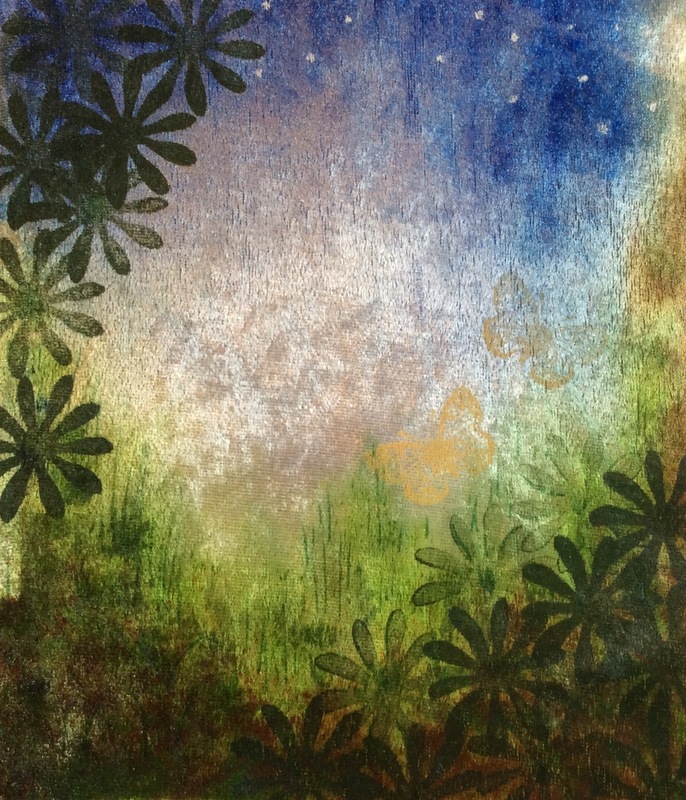 I used Inktense Blocks (finely grated and added to water in a spritzer bottle) as a spray paint for the background. 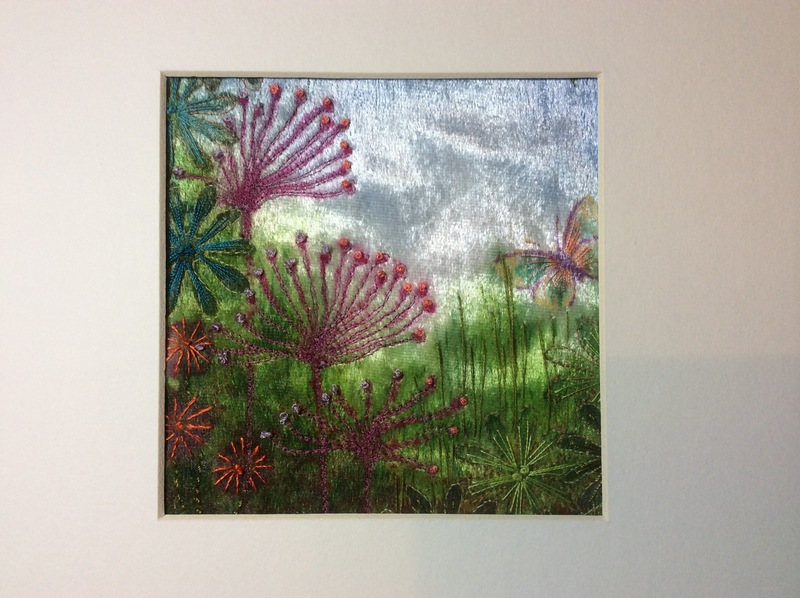 The stamping was done using VersaCraft multipurpose pigment ink as recommended by Craft Test Dummies, many thanks for the tip! 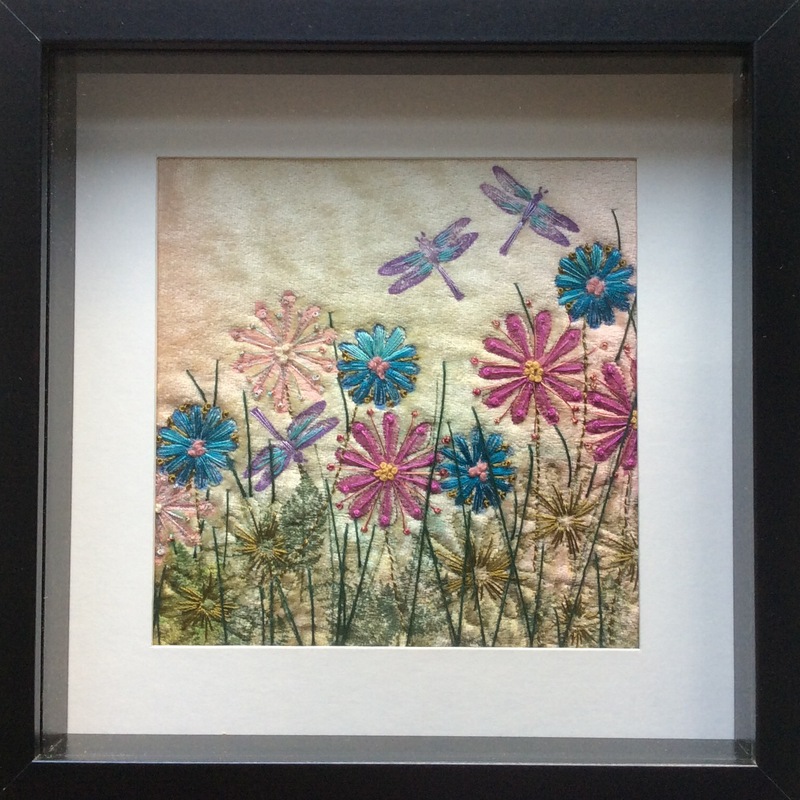 I bought the dragonfly stamp but made the flower stamps using a pack of funky foam shapes (from Poundland) glued to small wooden blocks. ← Susan Denton comes to Lincolnshire….. Thanks Sandra. I am really impressed with the strength of colour that can be achieved with the Inktense blocks and crayons, and that particular blue is a lovely shade.